We use premium vegetable and oil tanned leather of European origin cattle in our products. These are natural and durable materials that age gracefully. With proper care it can be used for decades. Avoid prolonged exposure to direct sunlight. The colour of the leather may react to sunlight. Lighter colors will get darker and darker colors will bleach. Natural leathers are not fond of high temperatures. If your bag gets wet, swipe off all drops of water with a piece of cloth and let the bag dry on the room temperature. Do not dry your wet bag on a radiator or close to any other heater. Remove stains or dirt with a damp cloth. You may also use special leather soap. To avoid shade differences clean the whole surface of the leather with circular movement. 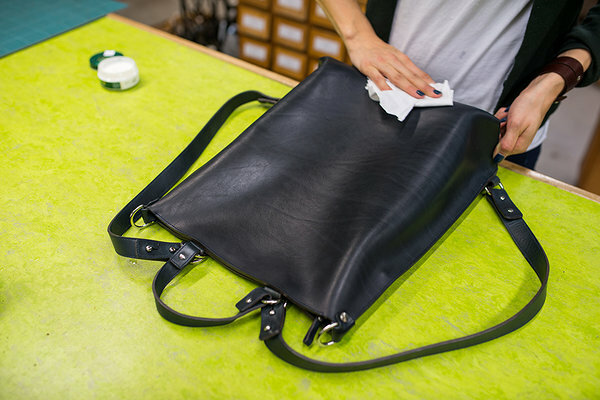 After cleaning apply natural moisturiser with a sponge to nourish and protect the leather. Remove excessive moisture with dry cloth.